The dense forest of houses below St Vincent’s Hospital, Darlinghurst obscures the landscape that existed there for nearly a century after the arrival of Europeans in Sydney. 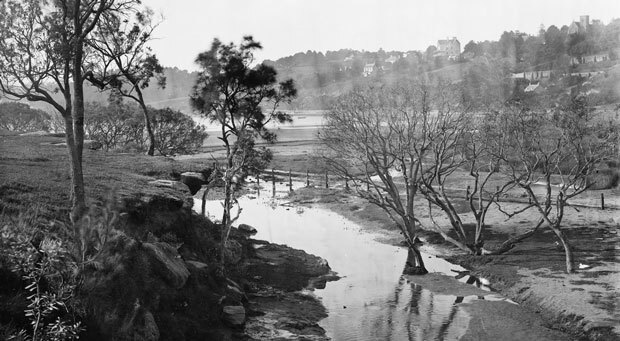 Rushcutters Creek, which flowed through pools and cascades down to the bay, is now buried beneath Boundary Street, and there is nothing left of the bush and paddocks that lay along its banks throughout most of the 19th century. From the 1810s the western bank of the stream was owned by Thomas West and his family and was known as Barcom Glen or West’s Bush (Barcom Avenue Reserve was within this area). The Wests built a mill along the stream and also ran a dairy, grazing their cattle in the paddocks along the stream, but much of the estate remained a forest. Aboriginal people used all of the bays of the harbour before the arrival of Europeans. Throughout the 19th century, Aboriginal people continued to fish these waters, and had a network of settlements which they used at different times. 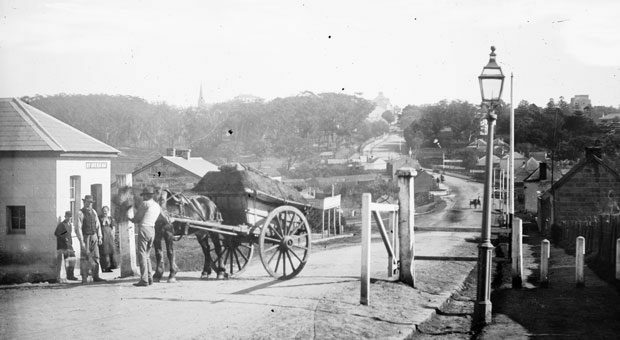 Barcom Glen was one of several Aboriginal settlements around Rushcutters Bay at different times, and appears to have been used until at least the 1860s. A track connecting the ridge of Oxford Street with Rushcutters Bay was known as ‘the Maroo’, an Aboriginal word for pathway, and most likely followed the route of an Aboriginal walking track. 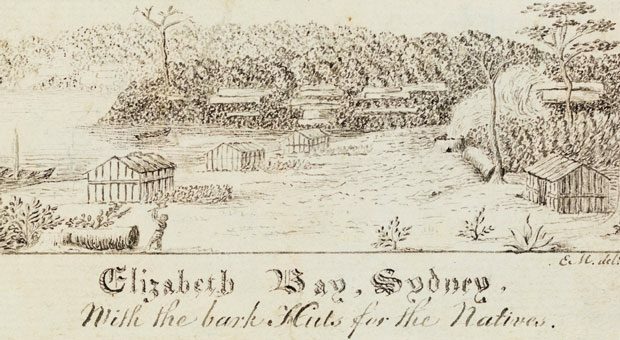 We do not know the names of the Aboriginal people who lived at Barcom Glen, but most Aboriginal settlements around Sydney Harbour housed anything from small families to groups to 20 or more people, and were not permanently occupied. Barcom Glen gave Aboriginal people access to fresh water, and a dam built on the property in the early 19th century most likely attracted birds and animals. It was also close to the fishing grounds where Rushcutters Creek wound its way through mudflats to the bay. Thomas West’s son Obed (1807-91) spent most of his life at Barcom Glen, and learnt about fishing and bush foods from its Aboriginal residents, as well as some of their language. Later in his life he recalled watching Aboriginal women fishing with hook and line and men with spears in Rushcutters Bay. Another local resident, Alfred Gelding (1858-1938), recalled seeing ‘many a corrobboree’ taking place at Barcom Glen, showing that Aboriginal people were still conducting ceremonial activities in the 1860s. Barcom Glen was also one of the places where Aboriginal people received government blankets at this time. 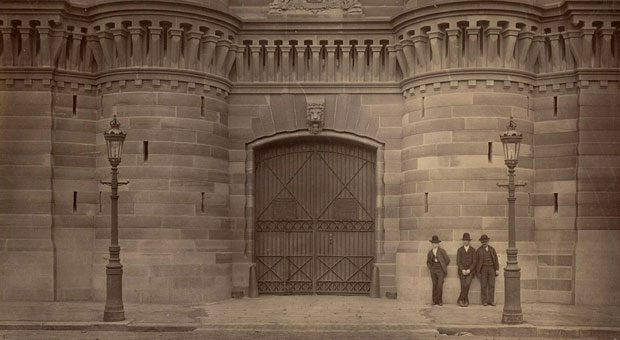 This custom began in the 1820s, and from the 1840s was organised by a committee of ‘native born’ Europeans, many of whom lived in the city or eastern suburbs. 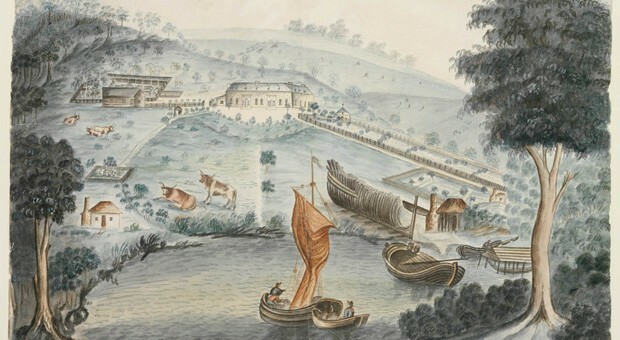 After the 1860s there are no direct records of Aboriginal people living at Barcom Glen, but we know that Aboriginal people continued to live elsewhere around Rushcutters Bay until the turn of the century, when most moved to the Aboriginal fishing village and mission at La Perouse.